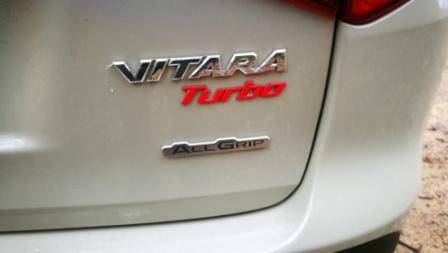 Car Review: Suzuki Vitara S Turbo All-Grip | | A Wheel Thing. 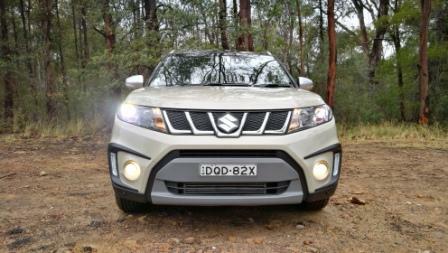 It’s been some time between drives with Suzuki‘s cool and funky Vitara. A recent catch-up with the turbocharged petrol fed S Turbo All-Grip, one built in November 2016 and close to ten thousand kilometres on it gave us a chance to see how they’ve held together. Sizewise the Vitara is a compact machine, with an overall length of just 4175mm. 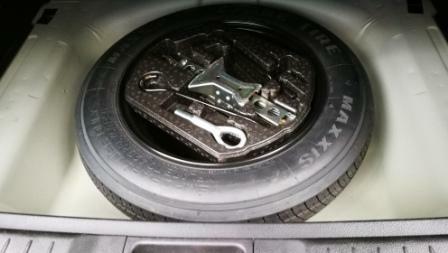 However clever packaging sees a wheelbase of 2500mm squeezed in. Breadth and height is decent too, at 1775mm and 1610mm. Up front is a 1.4L BoosterJet four, complete with 103kW and 220 torques from 1500 to 4000 revs. Transmission is a six speed auto and a torque split system to divert oomph from the front to the rear on demand. Having said that there is a drive mode selector button inside for Sports and Sand/Snow which lights up on the monochrome centre dash display. The switchover is seamless but the transmission was prone to stuttering and hesitation when cold. There’s a win for economy though, with a thousand kilometre week finishing on 6.1L of 95RON being consumed per one hundred kilometres. 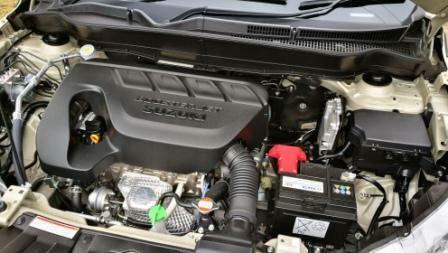 That’s from a 47 litre tank and pretty much on the money with Suzuki claiming a 6.2L/100 km for the combined cycle. Acceleration is pretty good, with that level of torque matching the light weight (1235 kg plus fuel and passengers). It’ll quickly and quietly drop a cog or two on demand and roll forward at speed easily enough. Overtaking then also becomes a simple matter of flexing the right ankle, and thanks again to its light weight, stopping is a brezze. Time and again the brakes would haul up the All-Grip with less than usual pressure but it helps when the pedal travel is intuitive and pressured well enough. It’s still the edgy yet slightly boxy shape that was available in the noughties, if perhaps somewhat more upright and squared off at either end. The front end sports LED driving lights in the lwoer quarters but also has globe lit driving lights that come on and override the LEDs when a switch on the indicator stalk is used. Hmm….The grille itself is a series of hexagons but it’s a solid sheet, meaning air is drawn in only through the lower extremities. 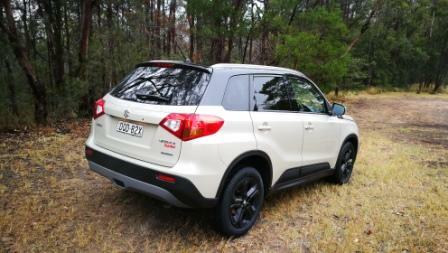 Rubber is not off road suitable, even though the Vitara is, ostensibly, capable of light off-roading. 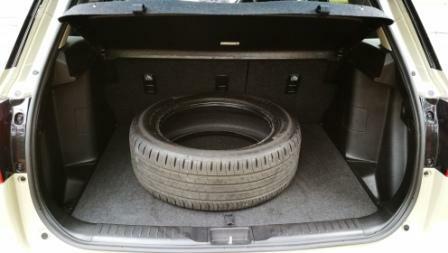 They’re 17 inch Continentals with a 215/55 profile, wrapping five spoke black alloys. Dry weather grip is superb but in the wet weather they combined with the MacPherson strut front & torsion beam rear to feel skittish. The coil springs fitted to the Vitara S Turbo All-Grip are tuned for a more sports oriented ride, with a small amount of compliance dialed in to give comfort initially. As such the whole package needed dialing back on accelerator and steering input on Sydney’s greasy roads, just to be sure. Ride and handling is well sorted otherwise. It’s comfortable, if a touch taut. Bang crash is minimal on catseyes, speed reducing bumps in shopping centres, and the bigger road based bumps. Unsettled surfaces have the Vitara All-Grip unflustered and the suspension tune allows the dips and wallows to be flattened out with nary an intrusion felt past a momentary bump. Turn-in is precise and feedback is natural from the front. Inside is a compact but non-claustrophobic workspace. 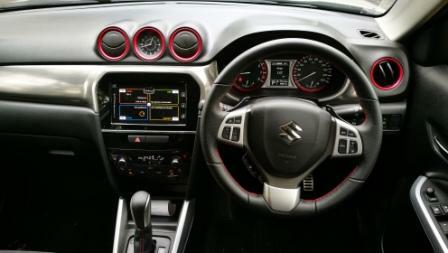 There’s splashes of colour such as the red ringed speedo and tacho displays matched by the simple twist and open airvents, a metallic grey insert on the passenger’s side of the dash, and alloy plastic touches on the tiller and gear selector. The radio is AM/FM only in this one, but partners with Apple CarPlay and voice command to provide interactivity. Satnav is standard across the Vitara range. 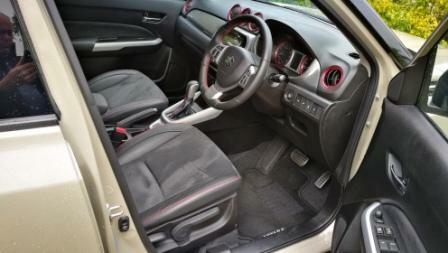 Safety is high with seven airbags including a kneebag, with a full suite of traction control systems. Autonomous Emergency Braking isn’t fitted but remember that this car was built a year and a half ago from the review date. ISOFIX seat restraint points are standard. Hill Hold Control is also fitted to all autos and Hill Descent Control is available for the All-Grip. There’s parking sensors, rain sensing wipers and reverse camera as well. 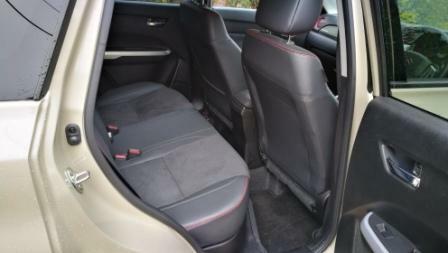 Cargo space of 375L (seats up, 710L down) is compromised by virtue of the car’s smallish size. Pop open the non powered rear door and there’s a split level cargo area with blind. The lower level highlights a major safety issue common to almost every car maker. That is a space saver spare. Consider for a moment that the Vitara is an off/soft road capable vehicle so fitting them with a space saver is hardly sensible. 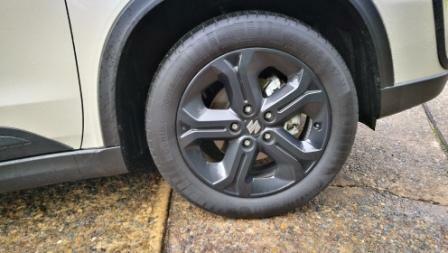 Consider also the dry weight of the Vitara is only 1235 kilograms so a full sized alloy would have been a minor weight impost over a steel space saver. 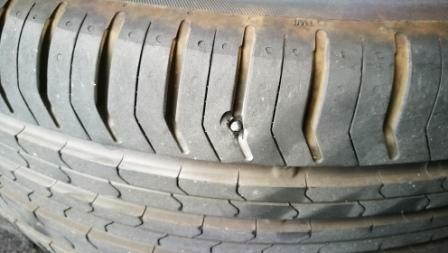 The car was driven on a longish day drive to Canberra and return, copping a vee shaped construction nail in the right rear. Complicit in the situation was the suspension tune as there was no indication of a flat. There was no pulling, no drag, no obvious noise as such. The tyre itself looked initially to have been only a nail but upon being “deconstructed” showed a clear groove on the inside exterior where it had rode the alloy’s rim. This resulted in an unwelcome ninety minute delay at a certain tyre retailer. At The End Of The Drive. 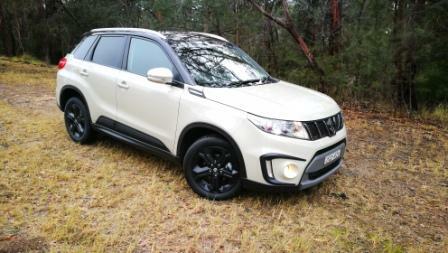 Be the first to comment on "Car Review: Suzuki Vitara S Turbo All-Grip"